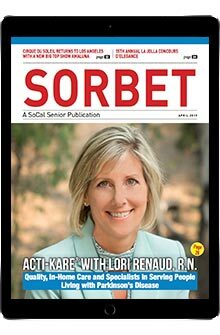 If your business serves 55+ seniors in Orange County, California, then Sorbet Magazine is your outlet of choice. Each issue of this monthly glossy format publication is direct-mailed into EVERY 55+ senior community in Orange County, direct- mailed to 55+ homeowners and is available on high-foot traffic stand locations and distribution locations across OC, including EVERY senior center and public library branch, as well as medical offices, hospitals, retail and restaurants. In addition to widespread distribution, competitive rates and a quality product, at Sorbet Magazine we enjoy connecting people – businesses to customers, people to people and community organizations to community members. Our advertisers and our readers are our friends. Let us create an added-value advertising/editorial package that works for you. Click here to see the Sorbet Media Kit. Click here to download Insertion Order.